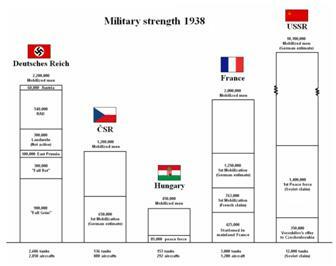 20.12 Counters representing all active Axis and Allied armor, infantry and air units, as well as certain naval actions (19.81), are placed on the Balance of Power Chart. In addition, research results are placed in the appropriate category on the Balance of Power Chart. 20.31 PLACEMENT OF COUNTERS: When Axis and Allied armor, infantry and air units are constructed, ships are launched, and modern battleships are laid down, generic Axis and Allied armor, infantry, air and naval counters are placed on the Balance of Power Chart. Similarly, when research and production results are achieved, the appropriate research counters are placed on the Balance of Power Chart. 20.32 LOCATION: Surplus counters are placed in the cells to the right of the other units. The balance of power for each category is determined by the number of unmatched counters for the superior side. The Axis begin the game with one specialized unit research result. Britain begins the game with one strategic bomber research result. Britain begins the game with two Royal Navy counters and one naval air training research result. 20.42 At the start of the game the balance of power is equal. A. +/-1 for one or two excess counters. B. +/-2 for three to five excess counters. C. +/-3 for six or more excess counters. 20.52 The maximum balance of power advantage for each category is +/-3. 20.53 The balance of power may change in the course of a turn. The balance of power at the relevant time is used. 20.54 The naval balance of power is modified by +/-1 in favor of whichever alliance is ahead in the battleship race (19.9). 20.55 Russian units are not considered in determining the balance of power. A. DIPLOMACY: The alliance with a balance of power advantage may, if permitted by its support level, place one or more military counters during the diplomatic phase (24.4). B. DECLARATIONS OF WAR: The balance of power affects the ability of Germany/Italy and Britain/France to declare war on one another (32). C. RUSSIAN GARRISION: The Russian garrison requirement is increased by one for each Axis armor, infantry and air balance of power advantage and is reduced by one for each Allied armor, infantry and air balance of power advantage. The naval balance of power is ignored (21.22B).